Positioned between Japan to the south and China to the north, throughout Korean history the country has overcome waves of invaders looking to control its resources. These days South Korea’s only invasion is from tourists. And they come for a good reason, as the cultural resources on offer are rich and plentiful. The keys to any culture can be found in its history. 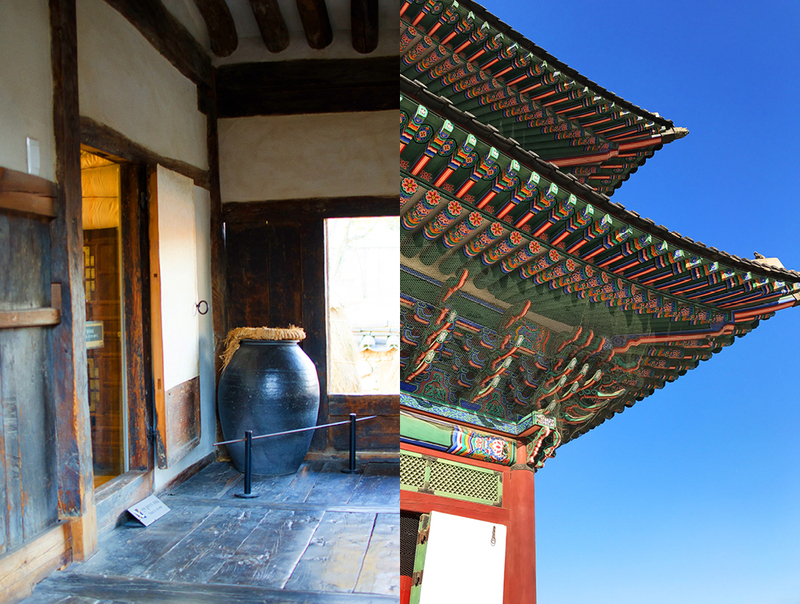 So we selected seven historically significant destinations in and around Seoul to help us unlock Korea’s secrets. 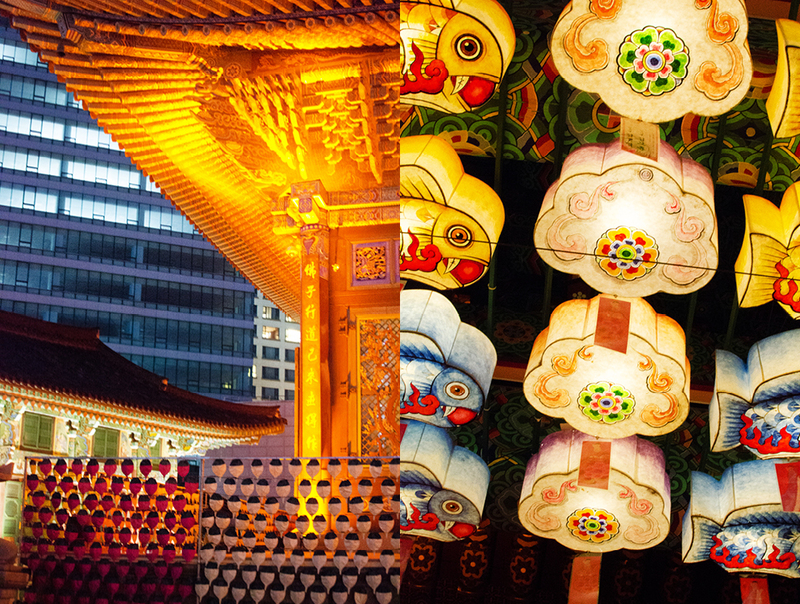 Join us as we explore Korean history and culture. 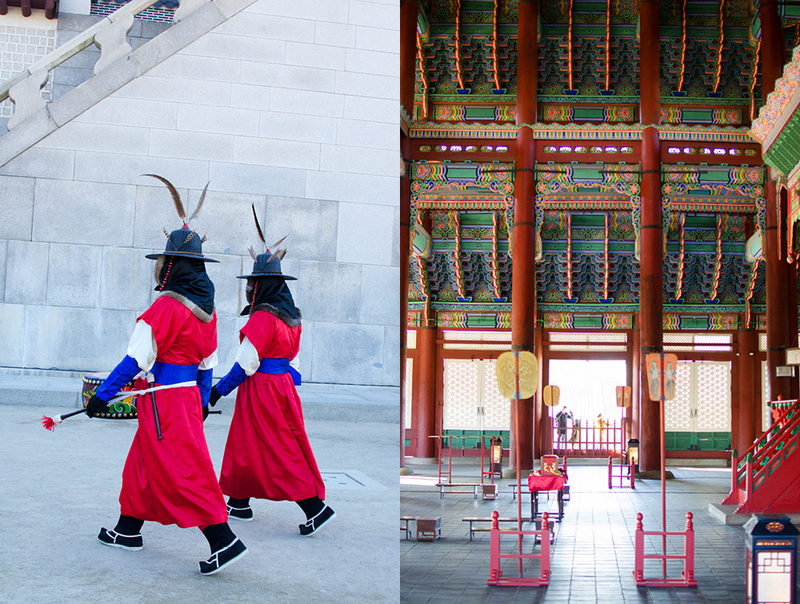 One of the most iconic sights in all of Korea is Seoul’s legendary Gyeongbokgung Palace. 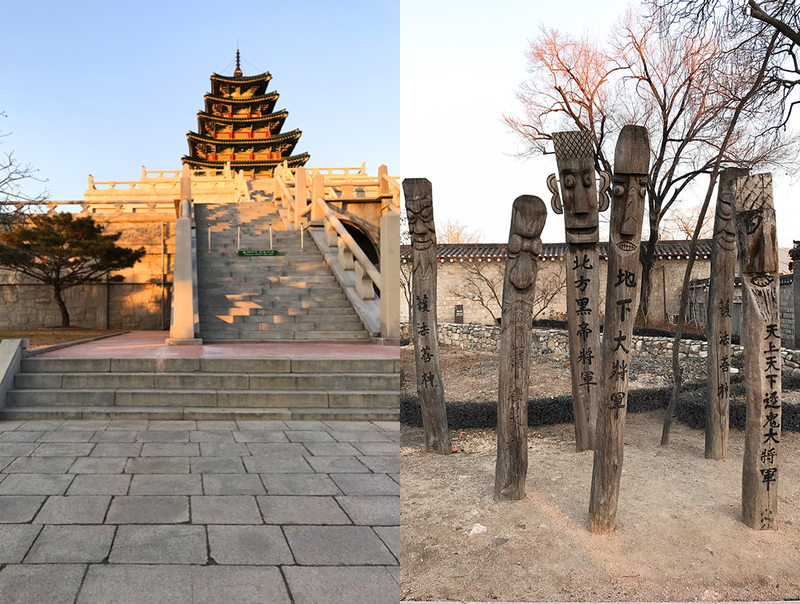 Built in 1394 by the founder of the Joseon Dynasty, King Taejo, it forms the heart of Seoul and is situated in the foreground of Mount Bugaksan one of Korea’s seven sacred mountains. 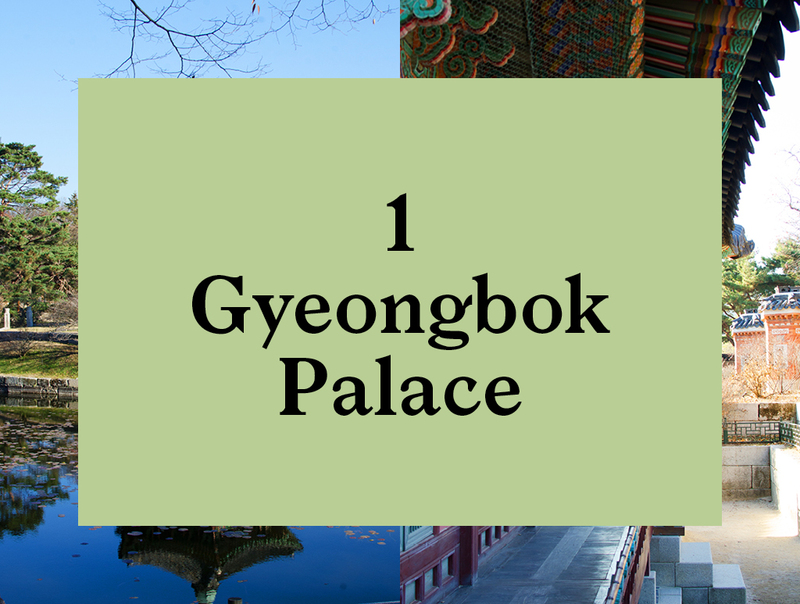 Its name means “Palace greatly blessed by Heaven”, which was given by an influential government minister of the time, Jeong Do-Joon. 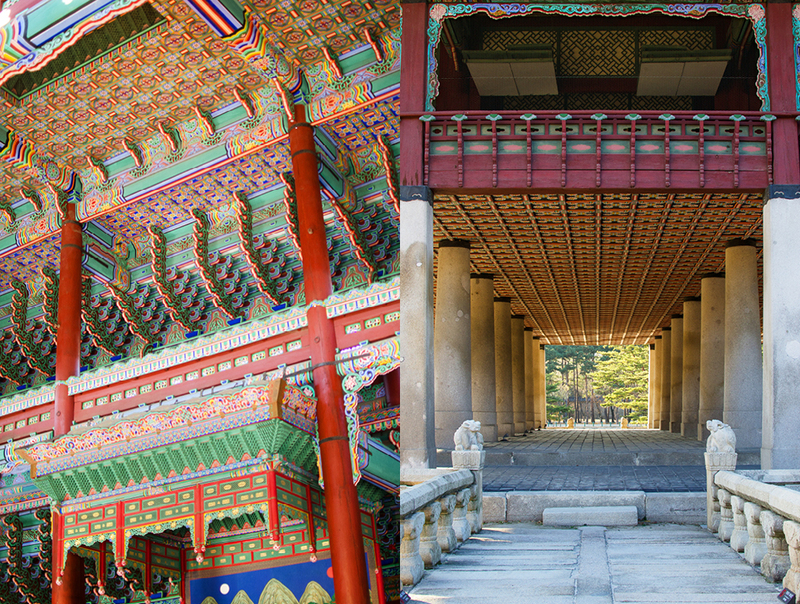 The palace saw continuous expansion during the reign of King Taejong and King Sejong the Great. 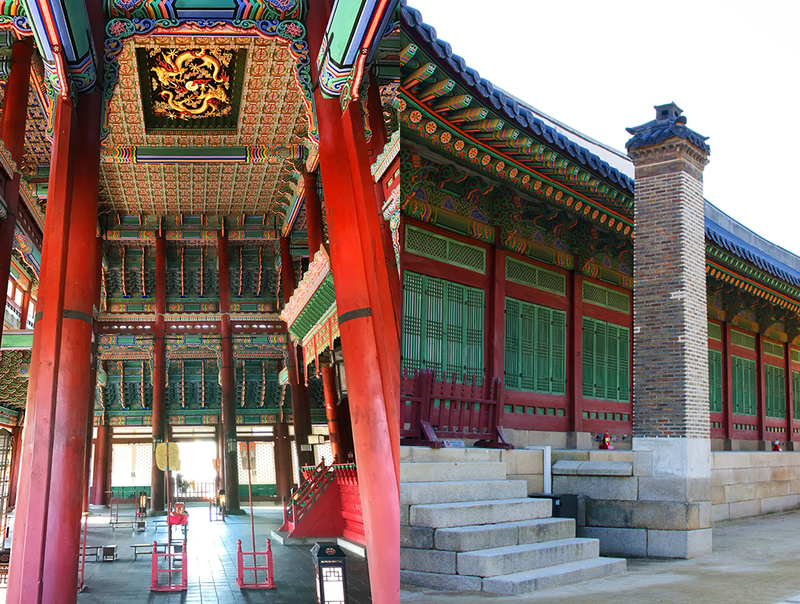 Severely damaged by fire in 1553, the reigning monarch, King Myeongjong, aggressively repaired the damage, completing work the following year. 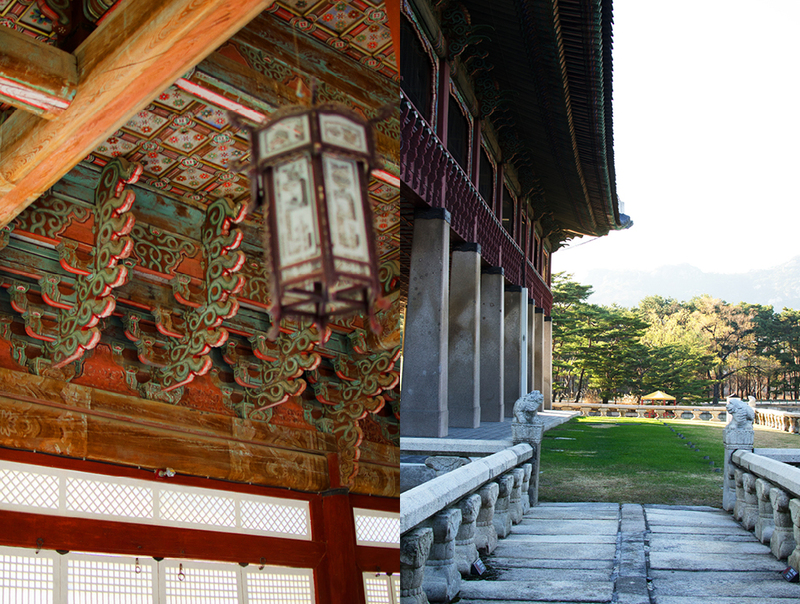 Decades later, the Palace was again burnt to the ground as a result of Japanese invasions starting in 1592, and the royal court was moved to the nearby Changdeokgung Palace. The destruction continued during the next wave of Japanese invasions starting in 1910, resulting in the ransacking and looting of much of the interior features that remained. 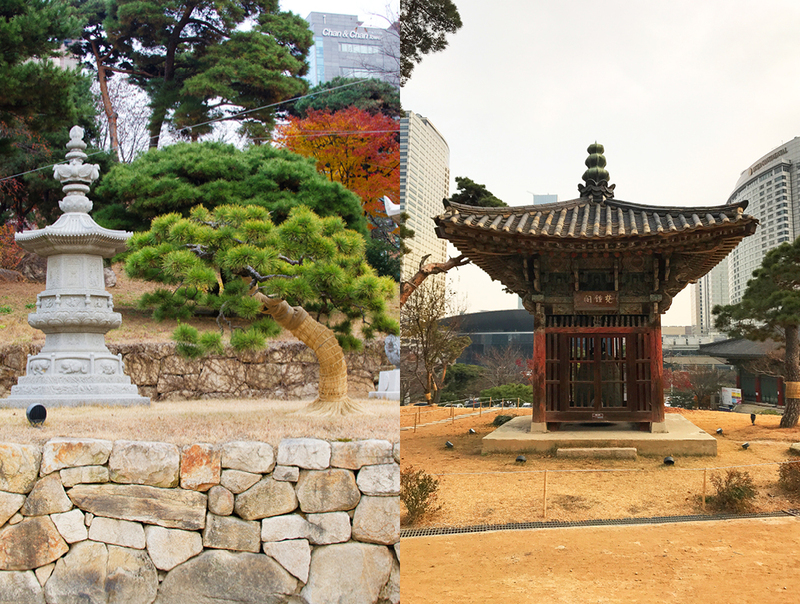 Finally, in 1989 the Korean government started a 40-year project to rebuild the hundreds of structures that were destroyed during the Japanese invasions. We began our tour just as the changing of the Royal guards got underway for the day. Fortunately, manuscripts from the Joseon Dynasty survived, which outline the ceremony being painstakingly reenacted today. It’s a great introduction to palace life. The palace grounds are vast, with its stately rooms and chambers surrounded by a multitude of secondary and tertiary chambers fanning out from the center. You get a great sense of how the multitudes that serviced the court would have lived and worked. 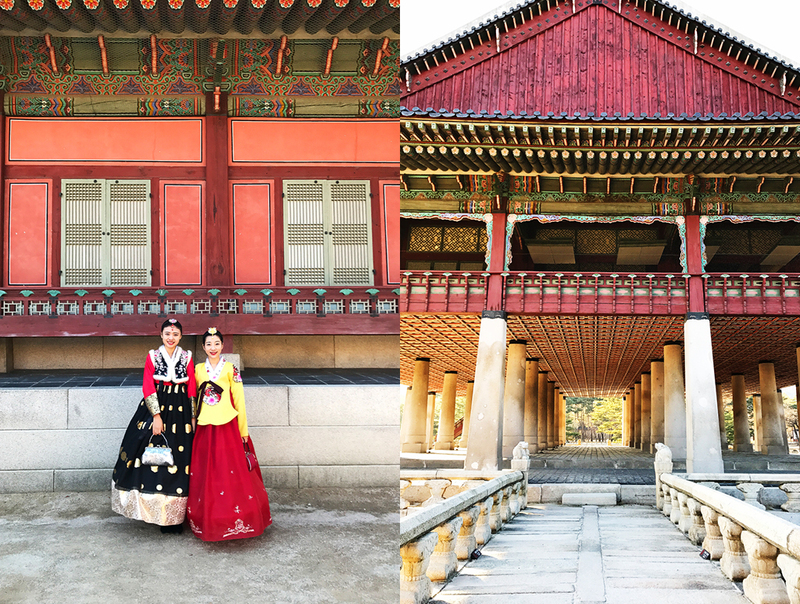 Adding to the epic scene is an endless flow of young Koreans who rent traditional costumes, called “Hanbok”, to wear while they roam around the palace. 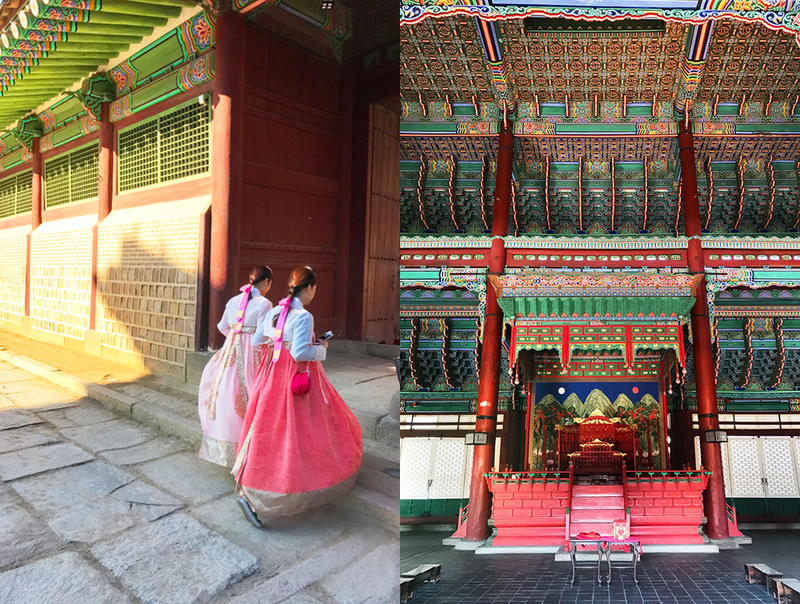 With hundreds of “extras” outfitted in traditional garb milling about, it’s not hard to imagine what it would have been like back during King Taejo’s reign. 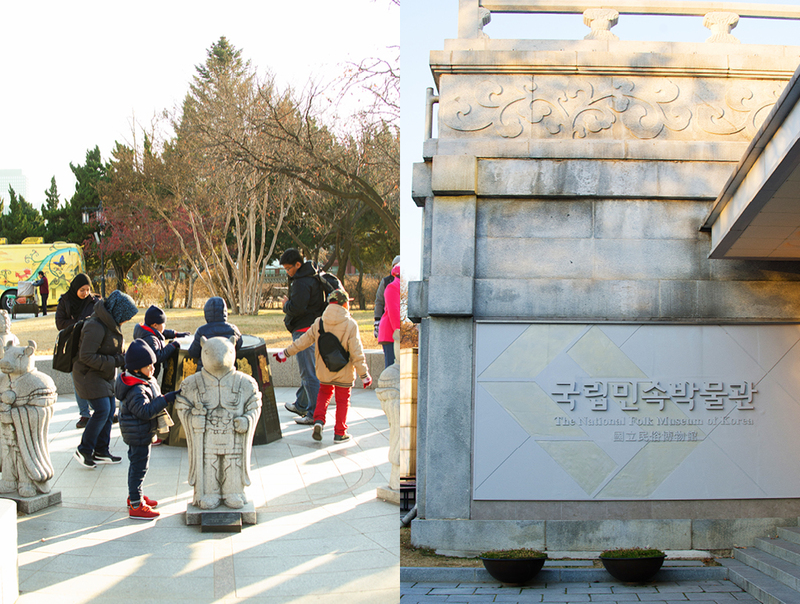 This is a great local tradition that helps to bring Korean history to life. And one that makes this an essential stop on your tour. 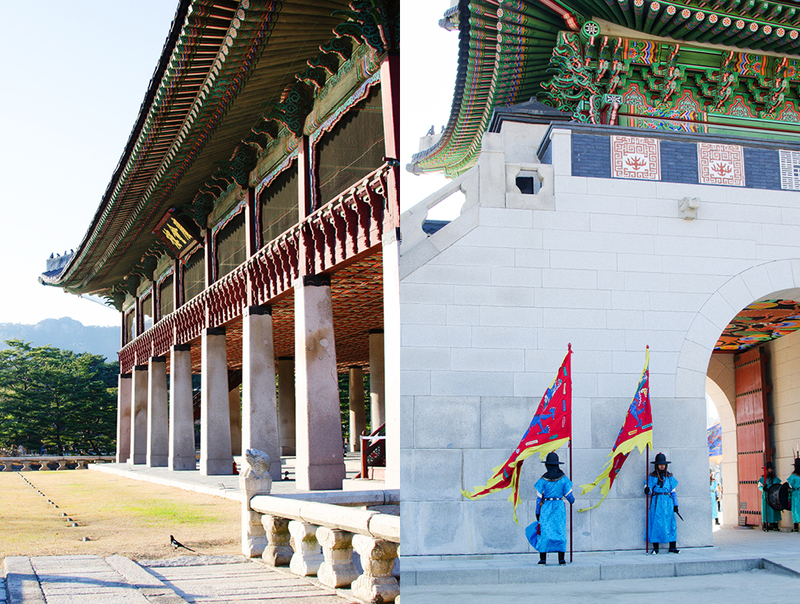 Just inside the Gyeongbokgung Palace grounds is the Korean National Folk Museum. 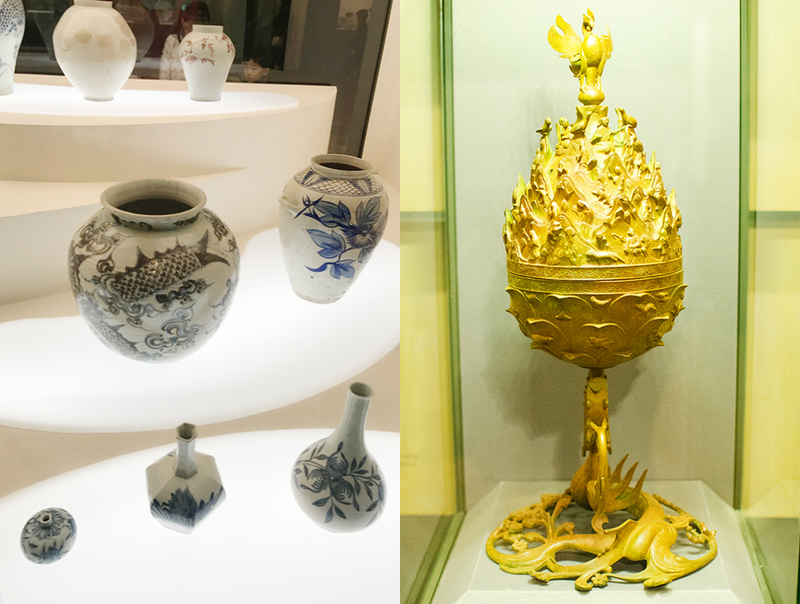 This is one of my favorite museums in Korea because it does such a great job of teaching visitors all about the unique Korean history and culture. 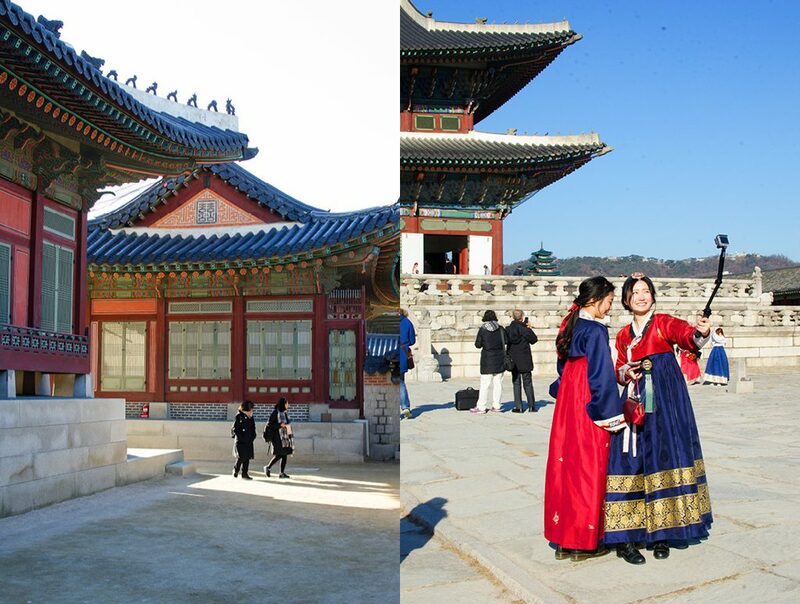 It’s an excellent choice for a first-day excursion, to immerse yourself in the culture. 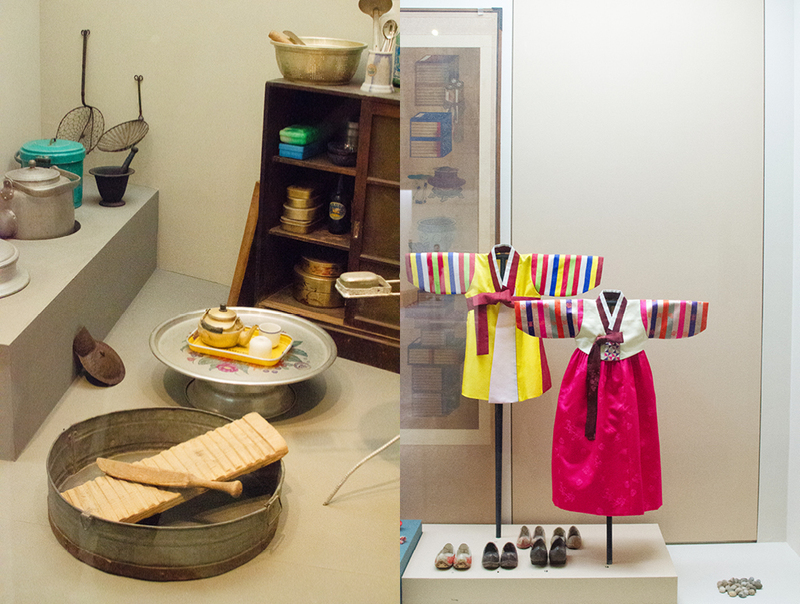 The museum presents, in chronological order, historical artifacts used in Korean daily life. 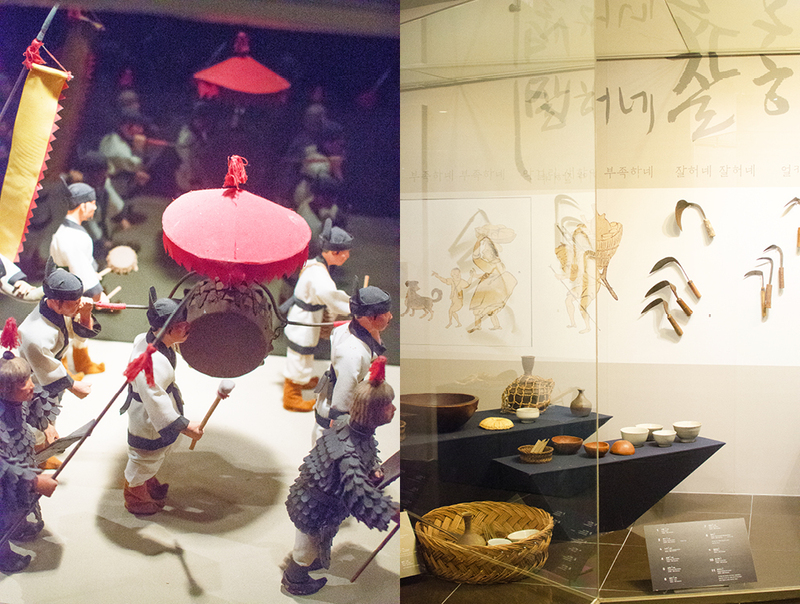 Through the informative displays, visitors learn about how Korean life was lived domestically, agriculturally and spiritually. 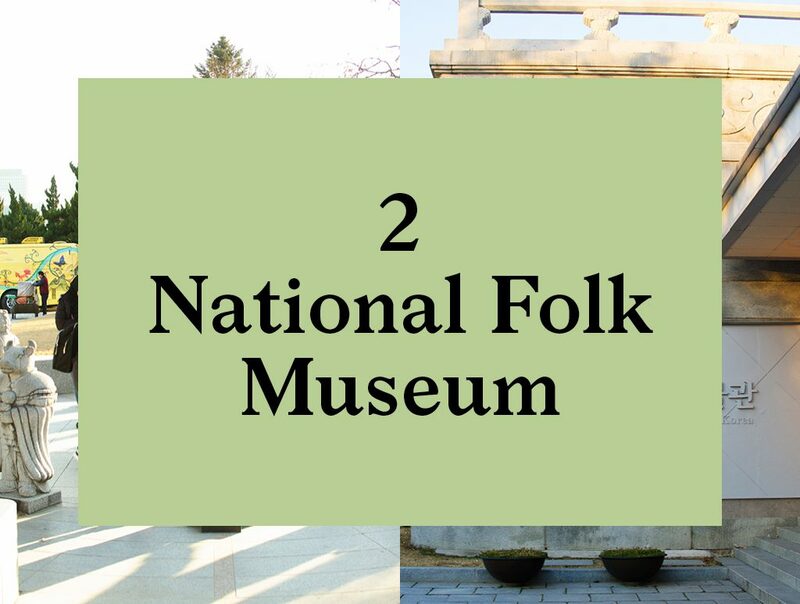 During our visit, it was great to see many grandparents explaining the exhibits to their young grandchildren, and telling stories as they roamed the displays. From the attentiveness of the tiny visitors, it was clear that they were being entertained. I wish we could have joined in. We left with a better understanding of Korean culture and felt much better prepared for our upcoming sightseeing. An interesting side note: The museum was established by the US government in 1945. Admission is free. 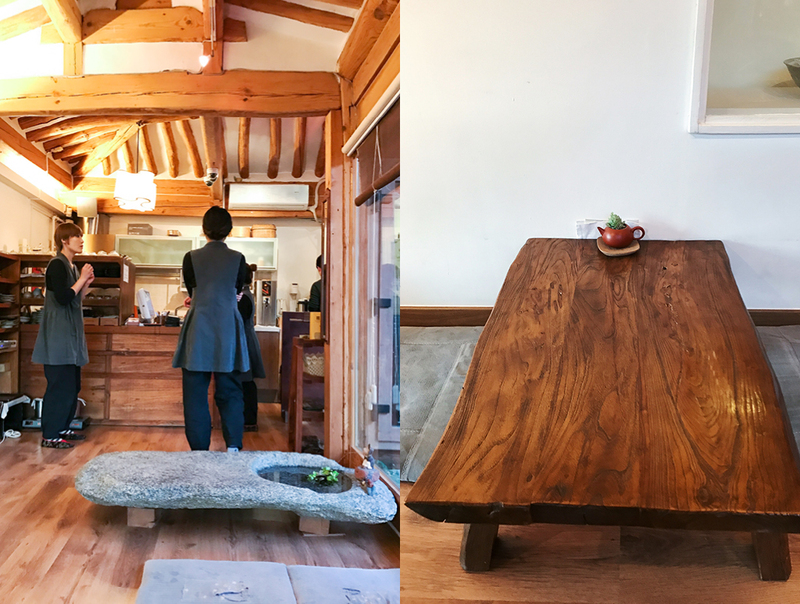 Just a short walk from the Museum is a very special tea house where we can dip into some of the liquid aspects of Korean culture. 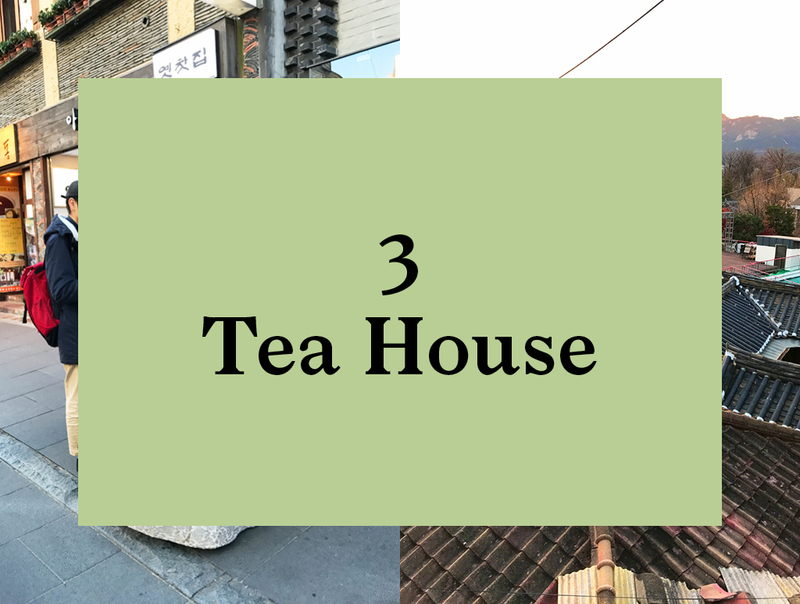 And what could be better after a couple of hours exploring Korean history and culture than a nice cup of tea? Exiting the gates of the museum you find yourself in the Samcheong-Dong district. 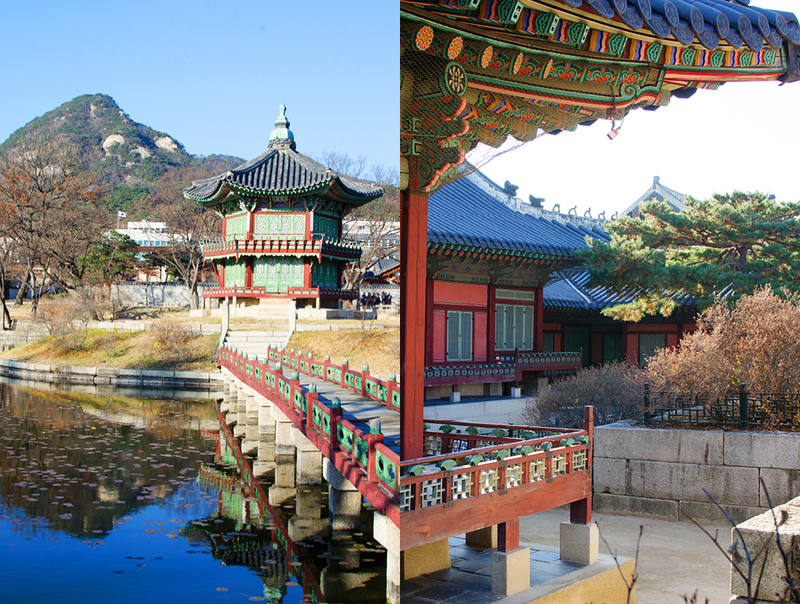 Samcheong is historically known for three things: clean water, beautiful mountains, and friendly residents. 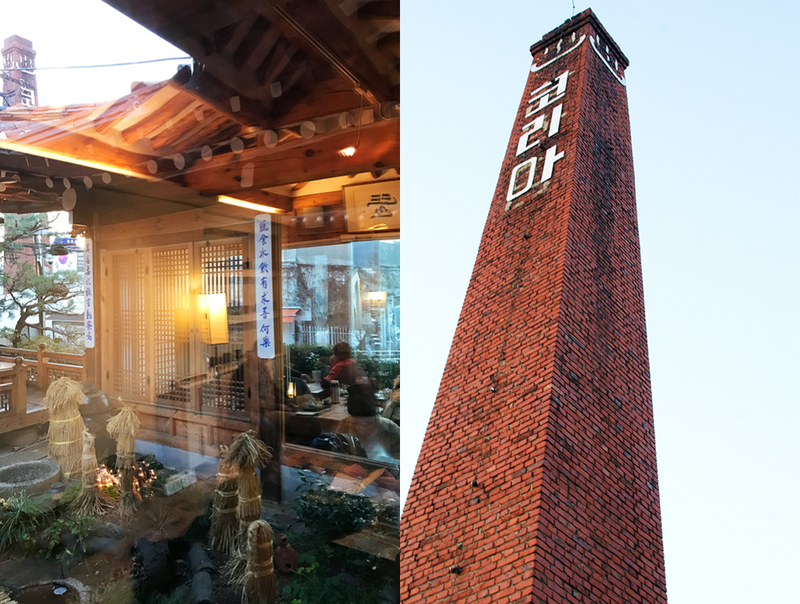 It is now the home to many art galleries mixed in with old traditional Korean buildings covering the hillside. 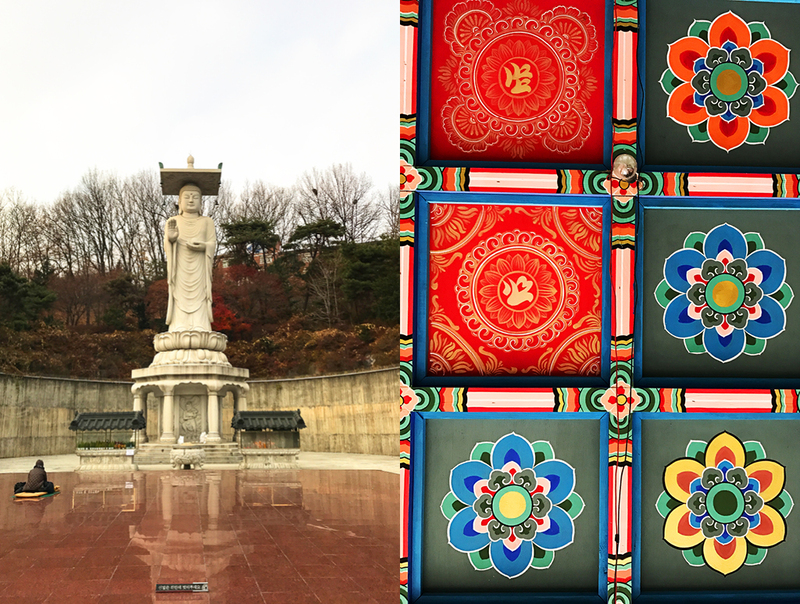 We wind our way up the hill to find Cha Massi-Neun Ddeul perched high above Seoul, overlooking Gyeongbokgung Palace. 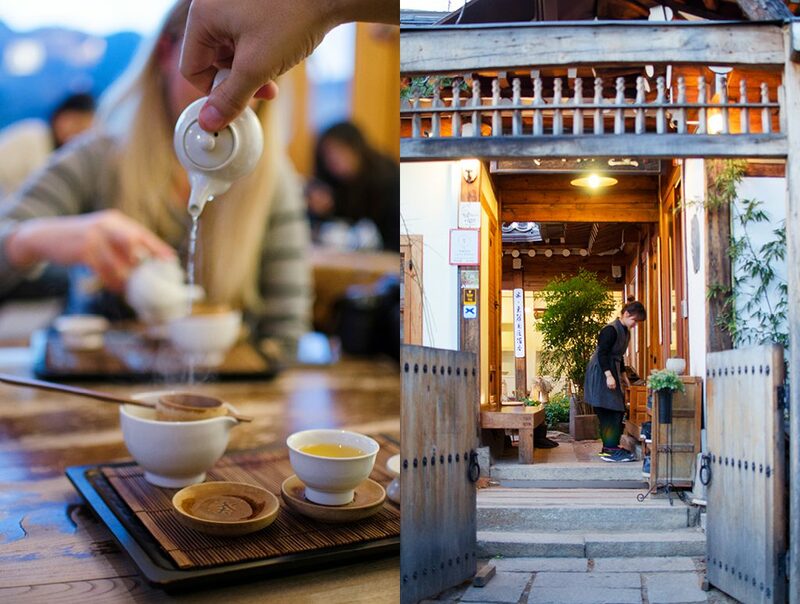 Cha Massi-Neun Ddeul literally means “a garden to drink tea” and this classic Korean tea house is exactly that. A three-sided structure surrounds a contemplation garden with floor-to-ceiling windows overlooking a tranquil garden on the inside and the bustling city on the opposite side. Quite the yin-yang arrangement. 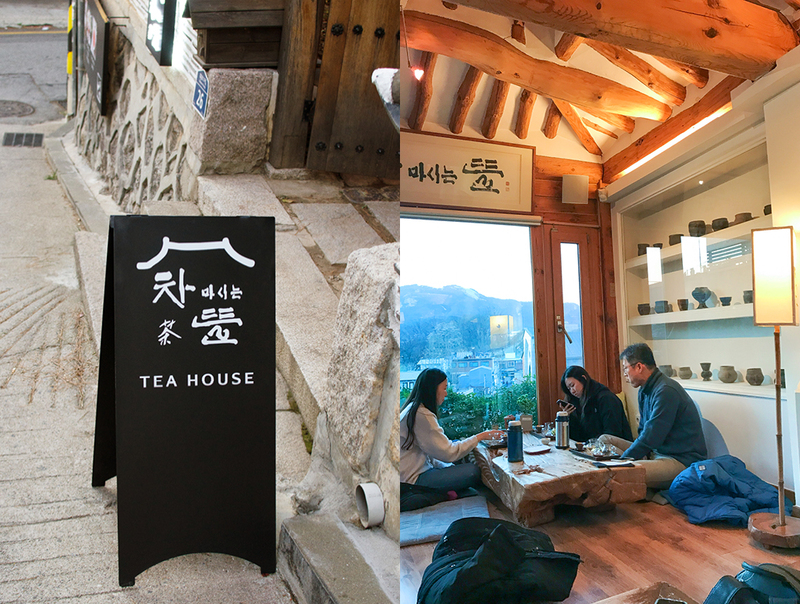 On offer is a good selection of traditional Korean teas and snacks. My favorite is the buckwheat tea. It has a slightly earthy taste which contrasts with my other choice, Mogwacha a subtly flavored quince tea. Mogwacha is high in Vitamin C and hence very popular in winter to ward off colds. The quince flavor also complements my “Hobaktteok”, a traditional steamed pumpkin rice cake. Airy, slightly sweet and sticky, it’s made to order in a small electric pot. Ingenious, and just delicious! 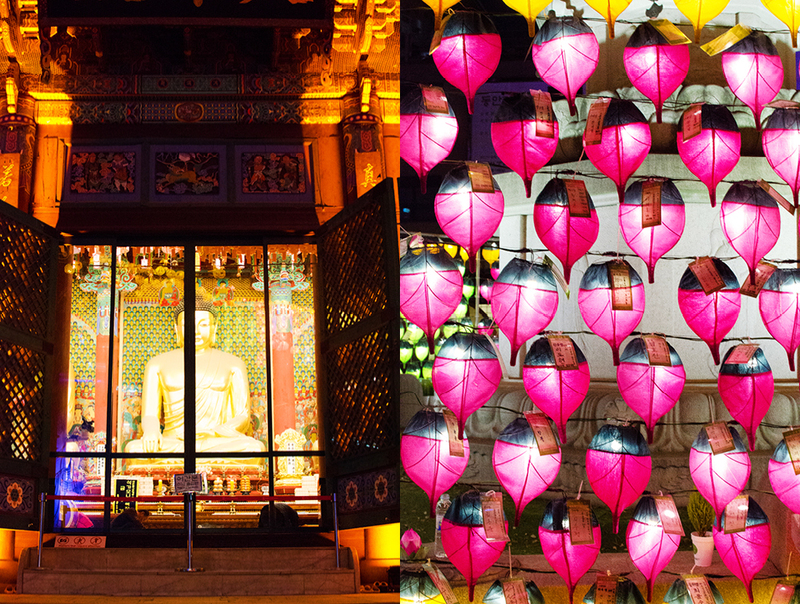 We enjoyed drinks and treats as the sun set over Gyeongbokgung Palace. What a fabulous way to end our first day in Korea. 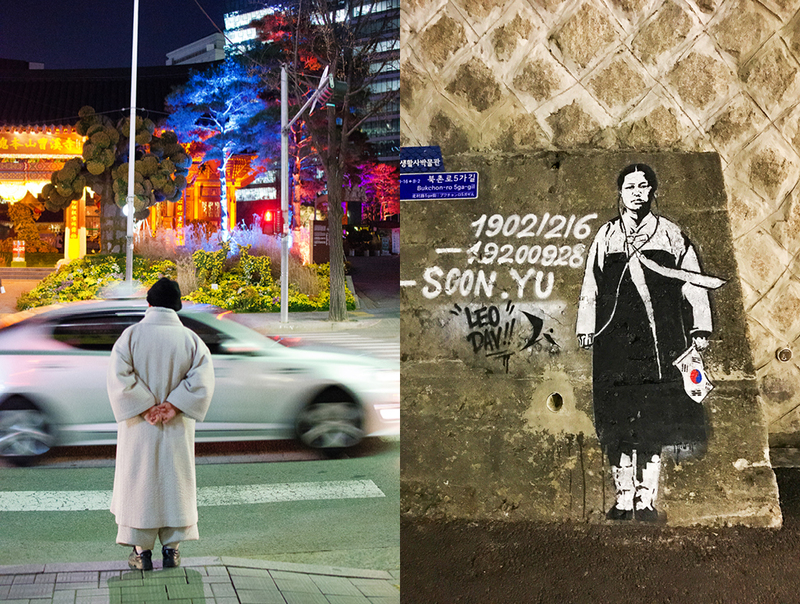 The next morning we’re off to the fashionable Gangnam district of Seoul, south of the Ichon-Dong river. 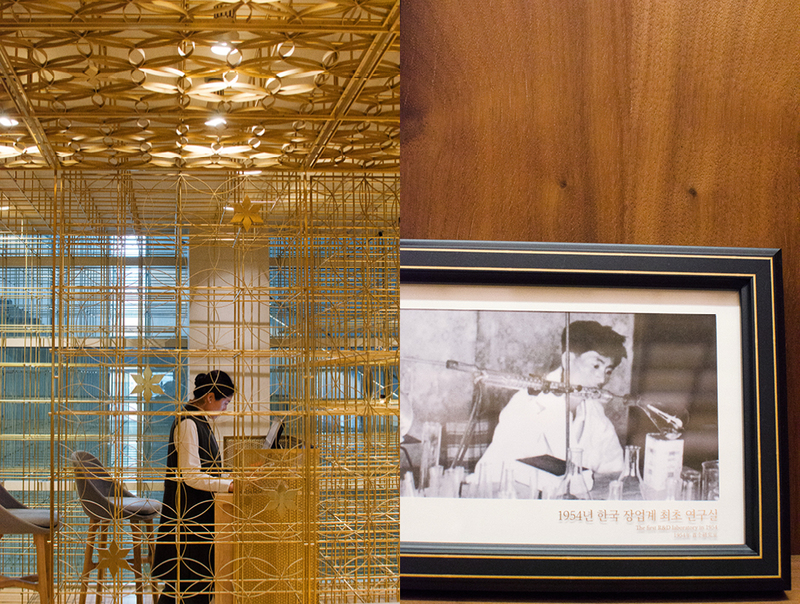 We are headed there to visit famous Korean skin care brand Sulwhasoo’s flagship store to learn about the long Korean history of skin care. 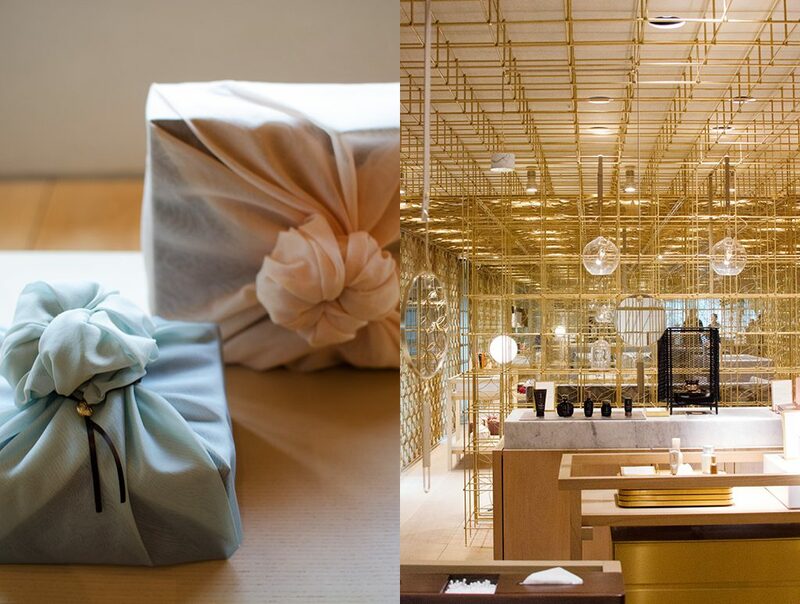 Throughout Korea’s history there has always been great pride in personal appearance, and various methods have been developed to protect one’s skin from the effects of the environment. Scrubs, oils, and lotions featuring extracts from plants were widely known and this local knowledge has formed the base of a thriving national industry. 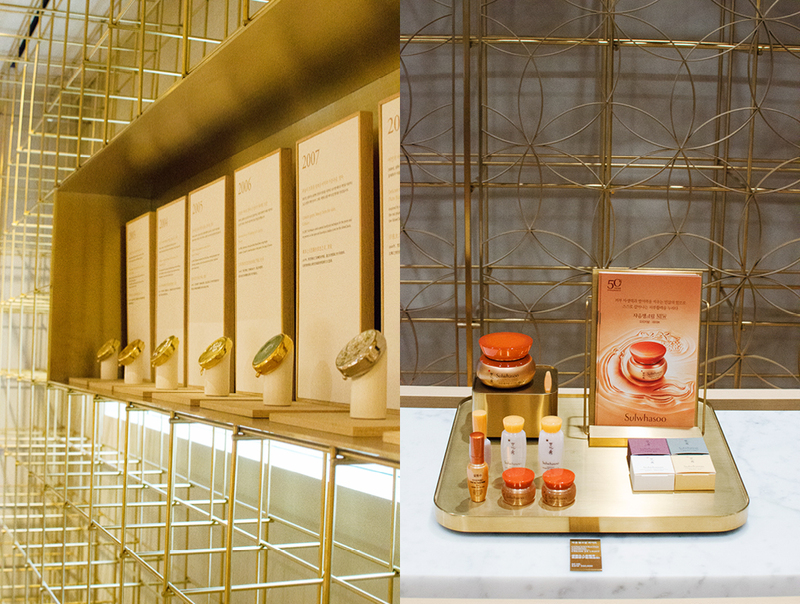 The stellar reputation for Korean skin care products has now expanded beyond its shores, and has become popular far away in the United States. 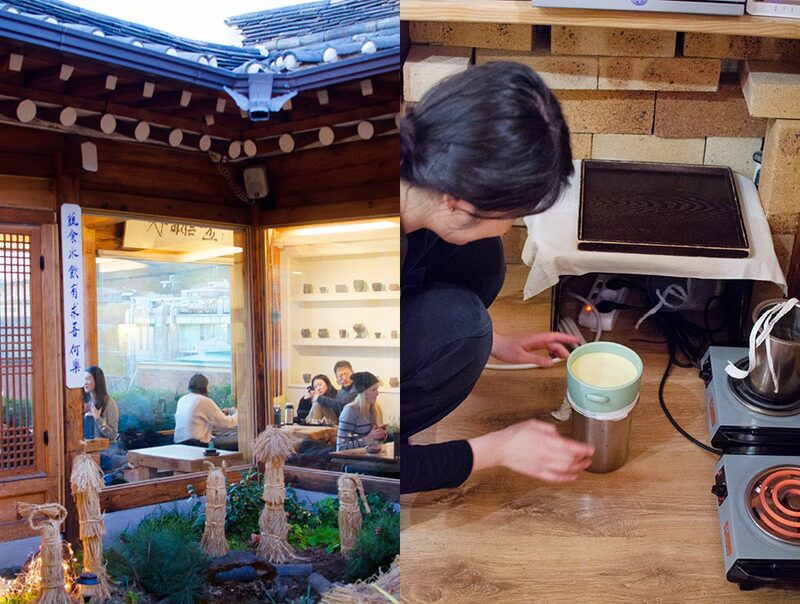 Sulwhasoo is one of the oldest and, now, leading brands promoting products based on traditional ingredients, remedies, and practices. 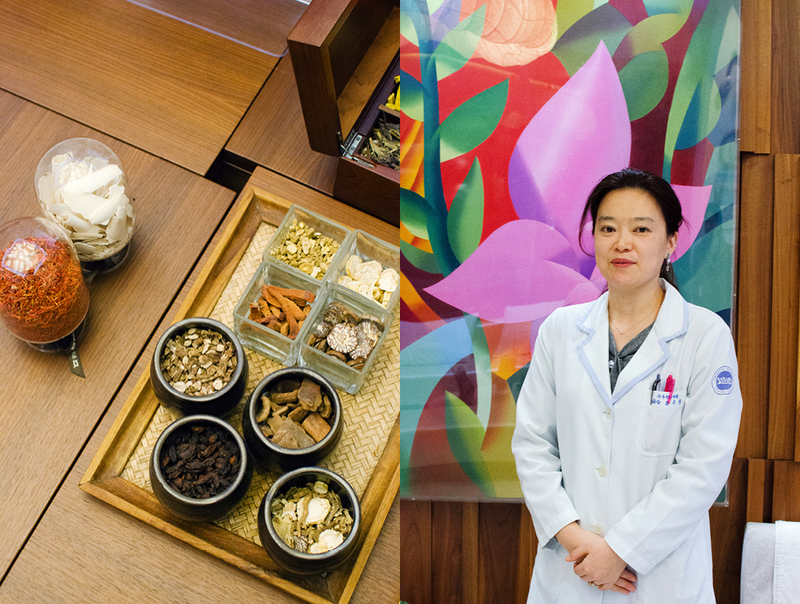 The driving force behind Sulwhasoo’s commitment to herbal medicinal skin care was the company’s founder, Suh Sung-whan. As a young boy living in Gaeseong, Korea, a city known for quality ginseng, he mastered the insight and know-how to find the best ingredients while helping his mother in her camellia oil business. Wholeheartedly believing in the healing powers of Korean medicinal herbs, he dedicated his life to finding new and innovative ways to use these herbs in skin care. 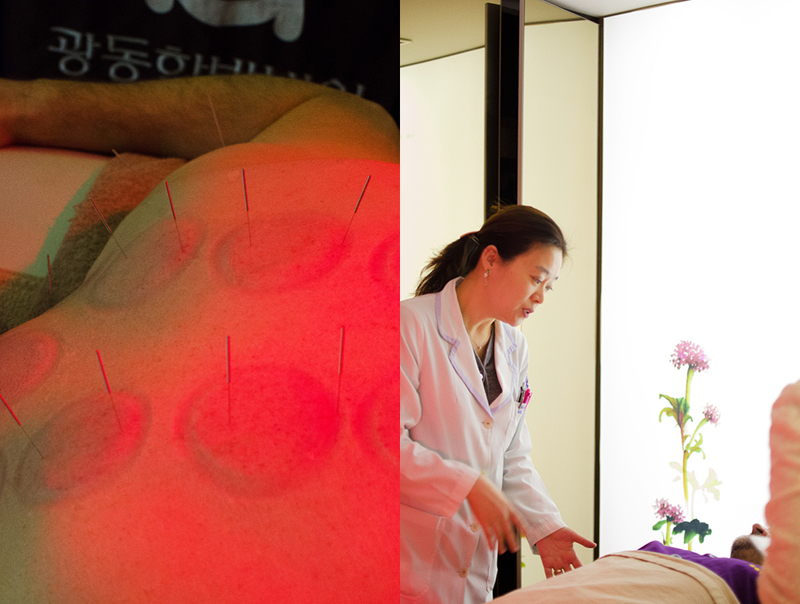 In Korean herbal medicine, it is believed that the body undergoes natural internal changes every seven years. At each of these milestones, energies within the body change. At the age of 35, some vital energies begin to taper off, causing imbalances. As a result, skin can become prone to dryness, dehydration, and is more vulnerable. 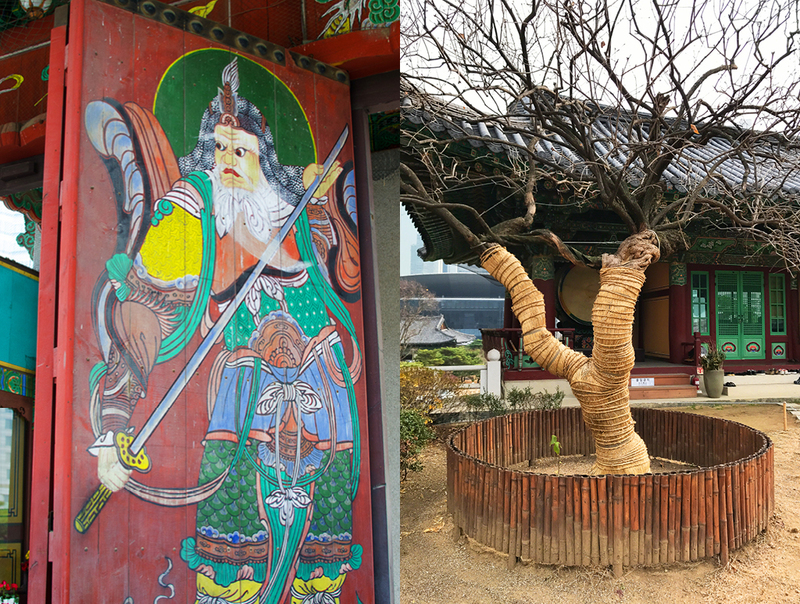 Sulwhasoo was unique for its early embrace of science in developing its remedies, even partnering with the renowned Kyunghee University of Oriental Medicine to develop various indigenous medicinal herb blends via traditional methods. Their collaboration draws on the ancient wisdom of the “Sang-Seng” philosophy which seeks to balance the inner energies of the skin that promote a nourished, healthy complexion. 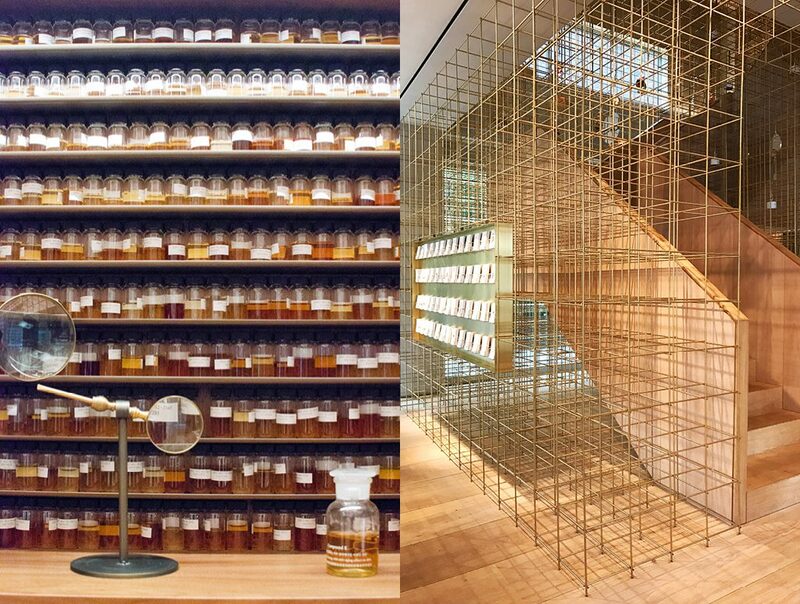 Visiting the flagship store and education center in Gangnam is an experience for all the senses. The products and history are on display but the environment should not be missed. 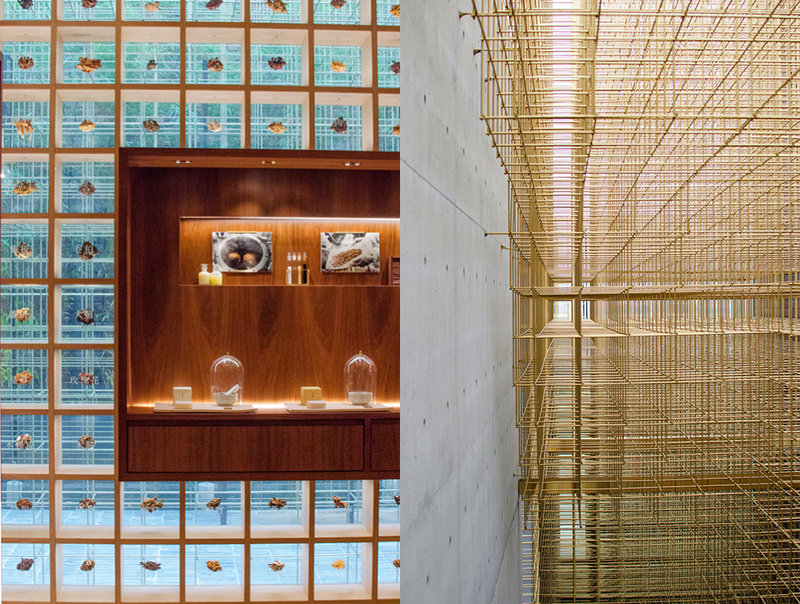 In 2016, the flagship store was renovated by Shanghai-based architect duo, Neri & Hu. 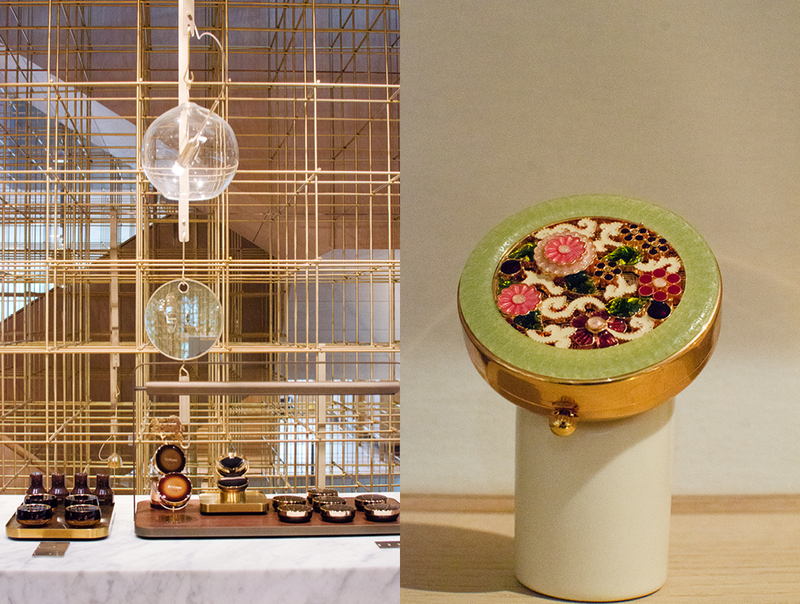 Taking inspiration from Asian lanterns which have been significant objects throughout Asian history, the architecture is a metaphor for a path through the darkness of the typical confusing cosmetic industry, showing you the way to good health through skin care. 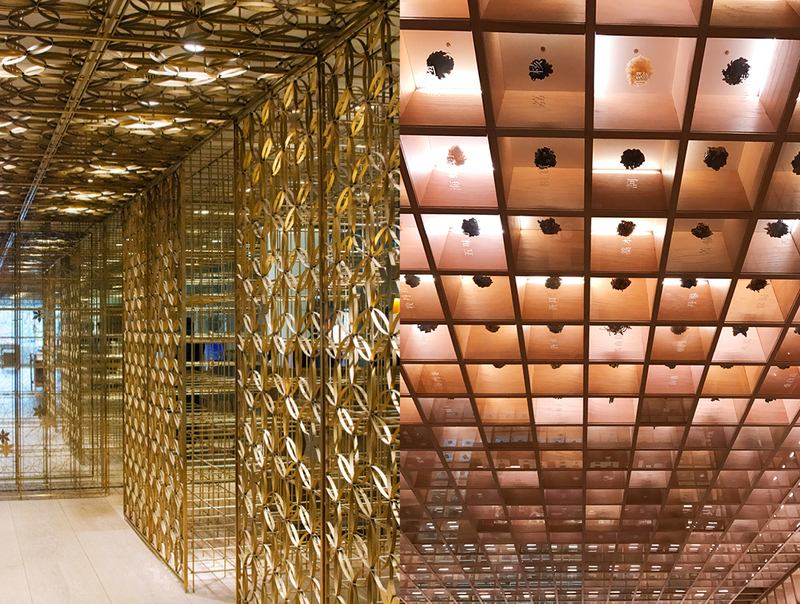 The inspiring brass structures wrap the inside of the building, guiding customers through Sulwhasoo’s history and product development process. 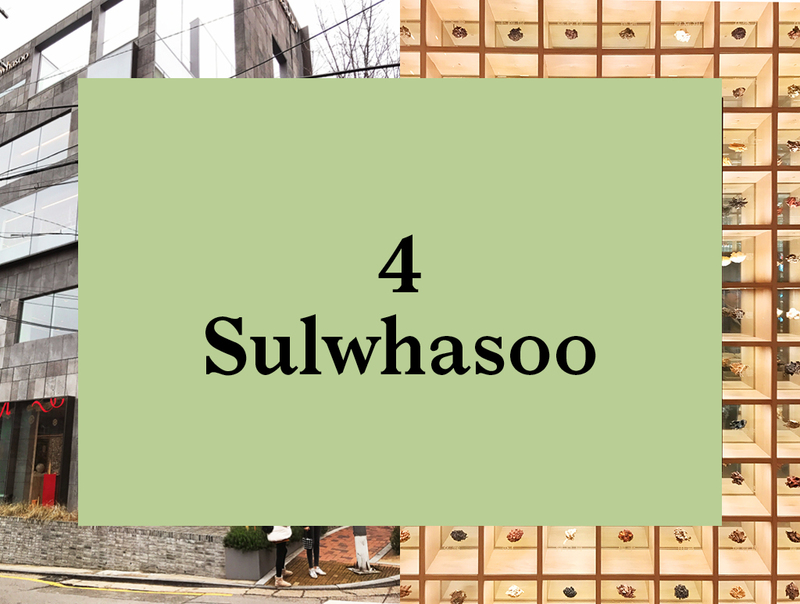 As carefully as Sulwhasoo develops its range of remedies it is just as meticulous in the way it packages its products. 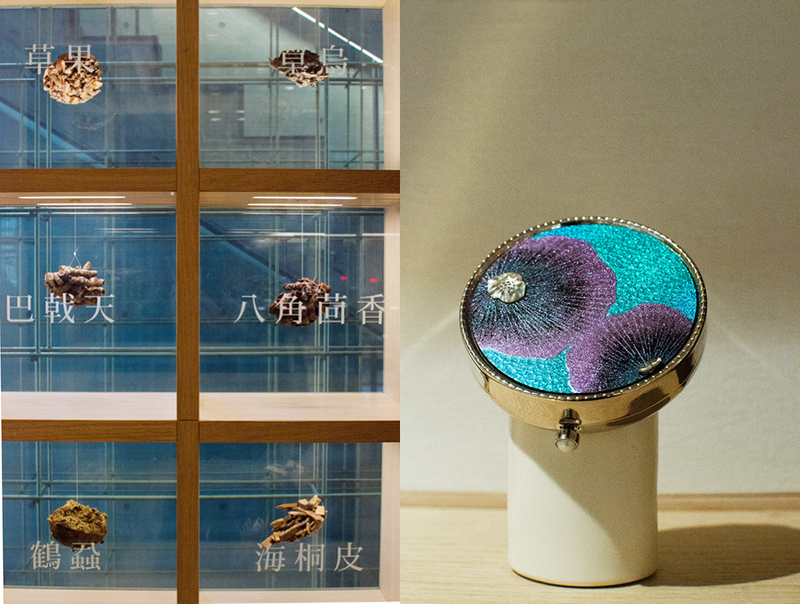 The resulting special edition compacts and wrapped gift sets are very special and prime candidates for gifts to bring your friends back home, or for yourself. Come prepared to learn a thing or two about the benefits of healthy skin and to add to your daily skin care regime. 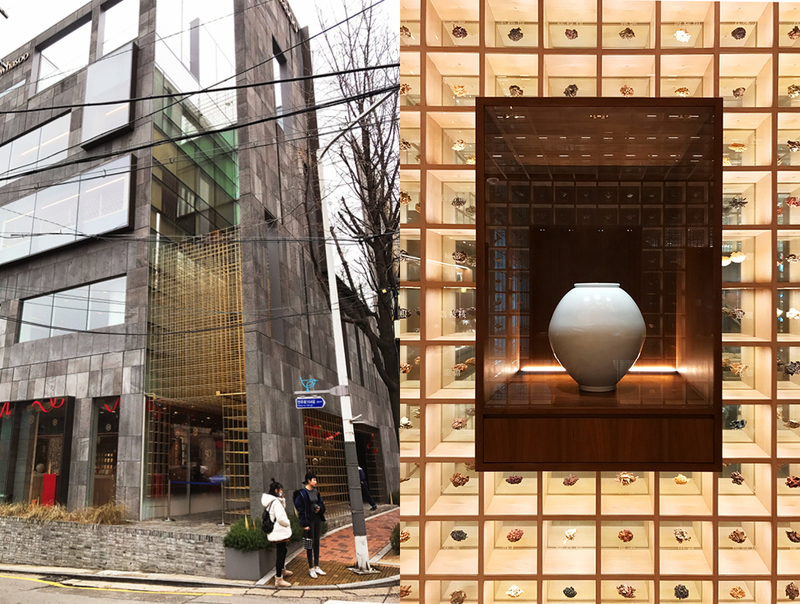 Conveniently, directly across the street from Sulwhasoo is a great little museum dedicated to Ahn Chang-ho (Pen name: Dosan). 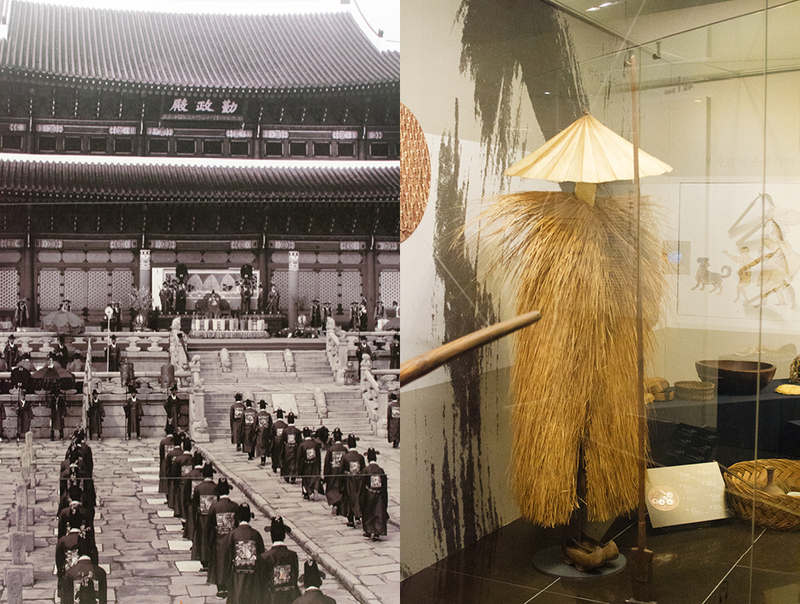 Ahn Chang-ho is a formative character in Korea’s modern history and visiting the one-room exhibition on his life is a great way to learn a bit about Korea during and after its period of Japanese occupation and its curious bond with the United States. 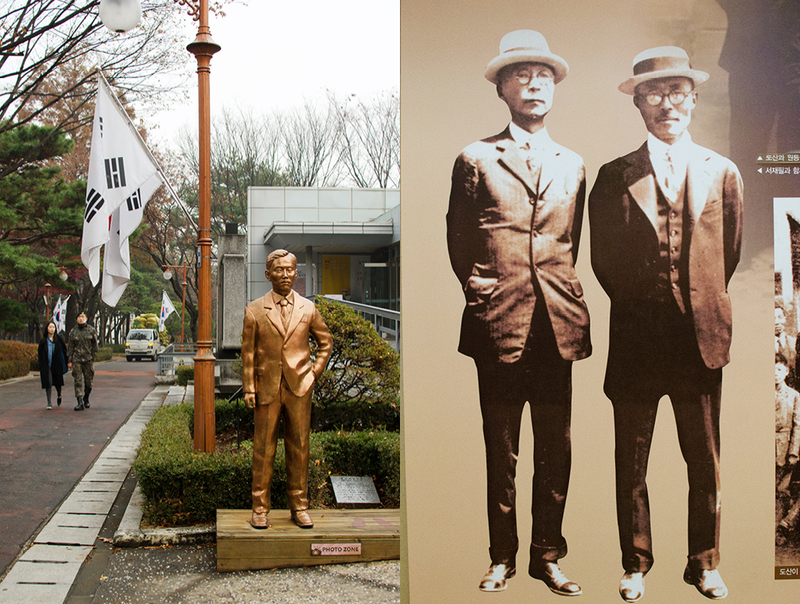 Ahn Chang-ho dedicated his whole life to both modernizing his country and to Korea’s independence movement. He was a great leader and mentor to the Korean people of his day. 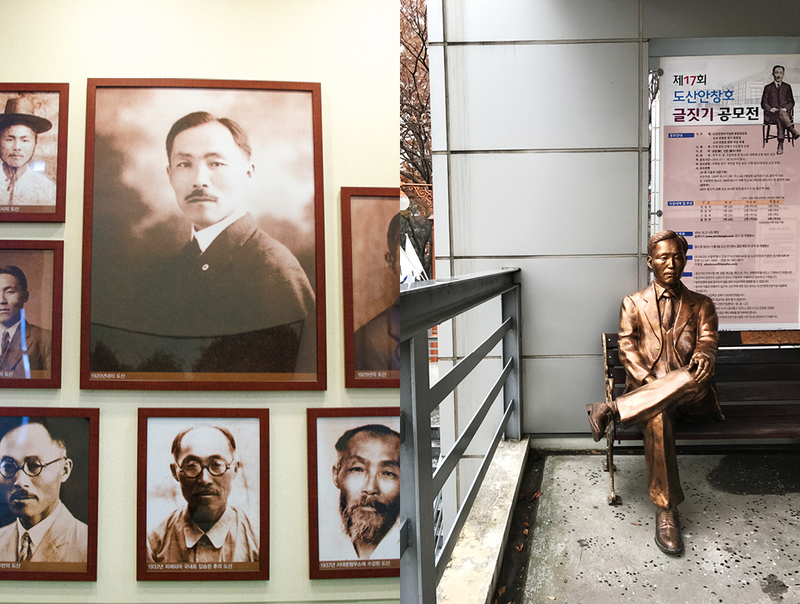 He also was one of the early leaders of the Korean-American immigrant community and many consider Ahn Chang-ho to be one of the key moral and philosophical leaders of Korea during the 20th century. In the turmoil immediately before and during the Japanese occupation in Korea, he called for a moral and spiritual renewal of the Korean people through education, as an important component in their struggle for independence and pursuit of a democratic society. Interestingly Ahn Chang-ho’s eldest daughter, Susan Ahn was the first female gunnery officer in the United States Navy. The museum’s displays are only in Korean, so visiting with a local guide to translate and tell Ahn Chang-ho’s story is helpful. 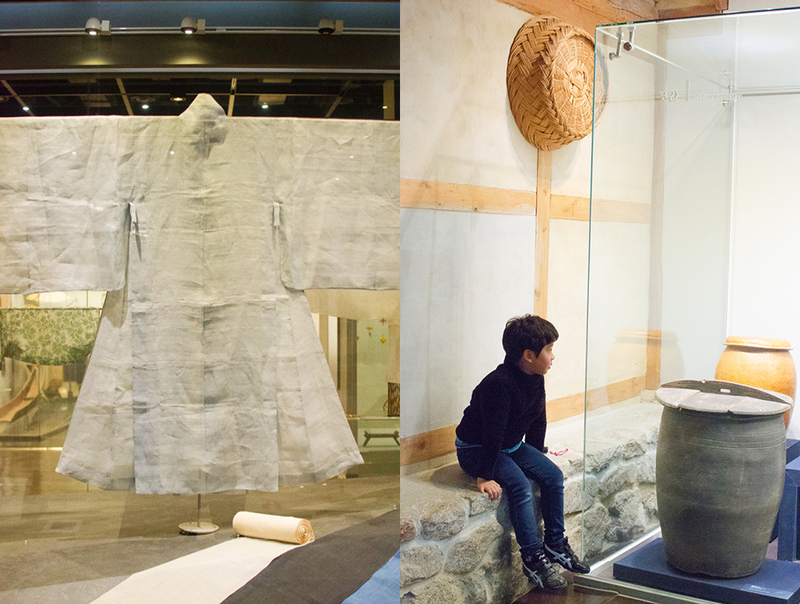 This is a great stop on your tour which helps fill in some of the details on Korea’s fascinating history. 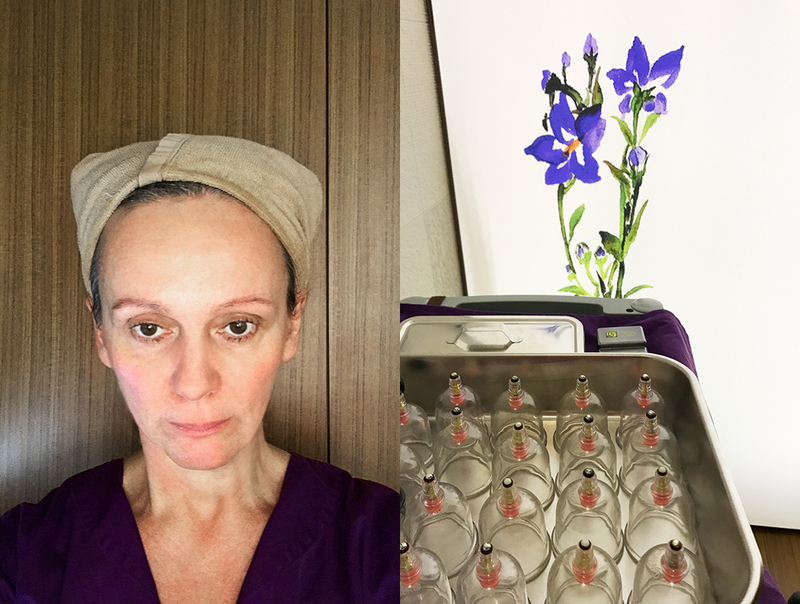 Visiting a hospital while on your holiday may sound like something has gone very wrong, but not in a culture where a traditional wellness routine is considered part of a healthy lifestyle. Here healthy people go to the hospital regularly and that’s how they stay that way. But considering their history, it no surprise. 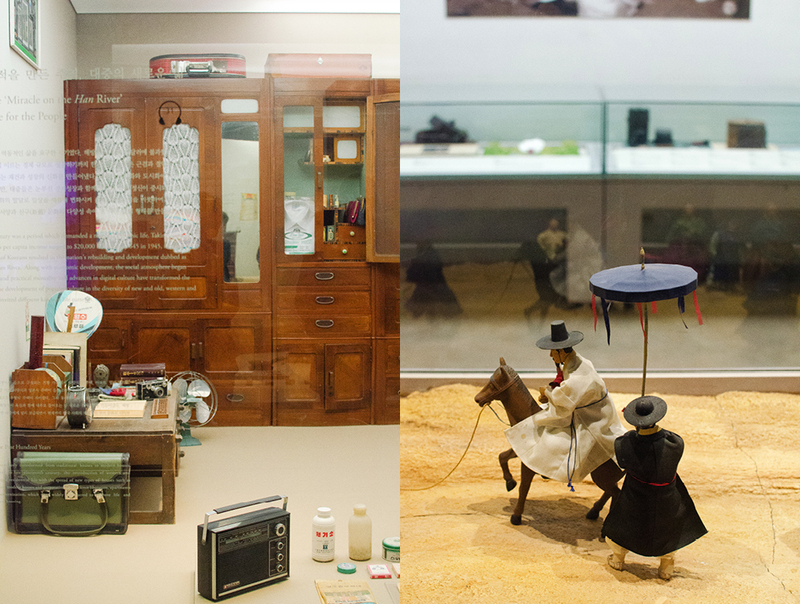 Koreans have been on the cutting edge of medicine practices from ancient times. Stone and bone needles used for healing from as early as 3000 BC have been found in North Hamgyong Province. 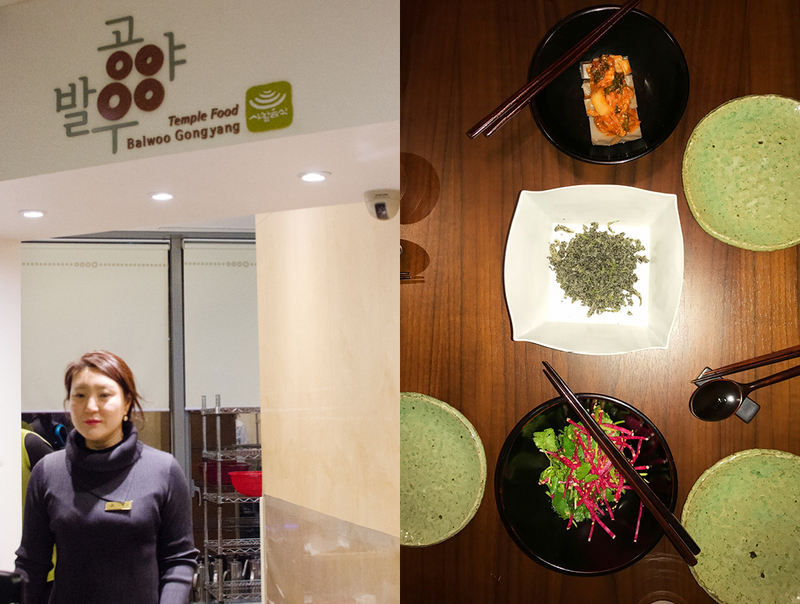 Koreans are generally strong believers in a disciplined approach to health and well-being. That might explain why a mere 3.2% of Koreans are overweight and the average life expectancy is a whopping 90 years! Kwangong was founded in the 1960s by Gasan Son Boo Choi, a first generation pharmacist who was notable for laying the foundation for the pharmaceutical industry in Korea. Today Kwangong produces pharmaceuticals and operates hospitals, and it has become one of the largest healthcare providers in Korea. Korea’s medical service industry is so successful and efficient that it has emerged as one of the country’s fastest growing tourist industries. 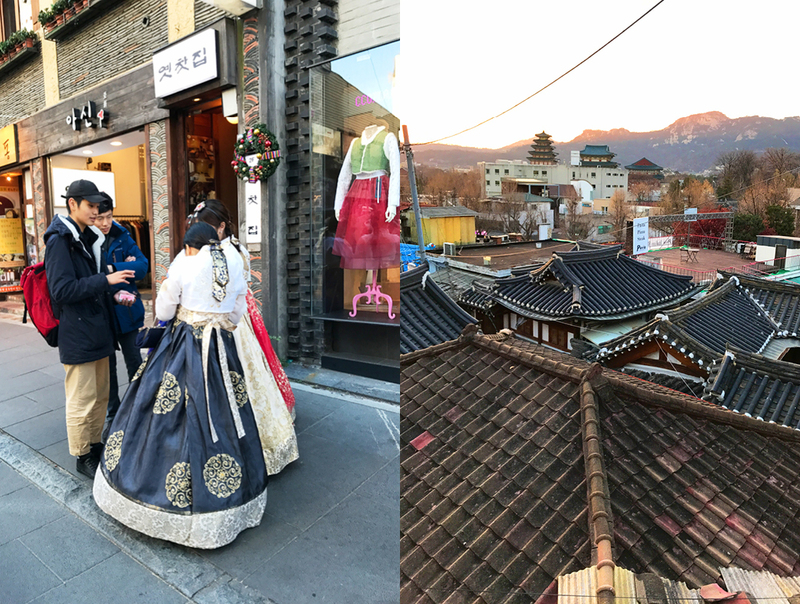 The government is investing heavily in promoting Korea’s health expertise by wooing tourists to come for their high quality and affordable treatment. On arrival in Seoul you can see the effort in action. There is a prominent place at the airport, just as you emerge from customs, to check in for your treatments. It’s estimated that by 2020 about 998,000 medical tourists will come for treatments, up from 399,000 in 2014. The hospital is divided into two areas: the classic western wing and the traditional treatment wing. We’re here to visit the traditional wing where treatments like acupuncture, cupping, massage, herbal wraps and other therapies are offered. We are greeted by a friendly receptionist who explains exactly what’s in store. We’re ushered into treatment rooms where we change into loose pajama-like outfits supplied by the hospital. The doctor comes in and, with the help of an interpreter, we discuss our aches and pains. As the doctor does an examination she lays out her recommendations for treatment. Aside from a few aches from injuries long ago we are mainly suffering from jet lag and the sore feet from our higher than normal walking routine. The doctor recommends acupuncture, cupping therapy, hot stone facials, and hot steam herbal wraps for our feet and legs. Quietly the doctor and nursing team zip in and out, facilitating the most relaxing three hours imaginable. In the end, I felt as if I had just completed a three week beach holiday. 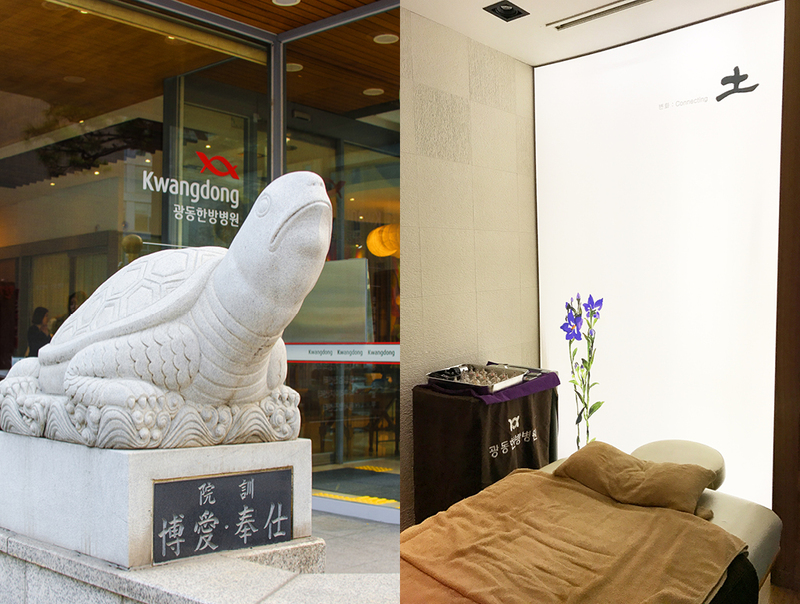 Many travelers to Seoul now make a visit to Kwangong for an intense wellness day part of their routine before heading home. I can see why. 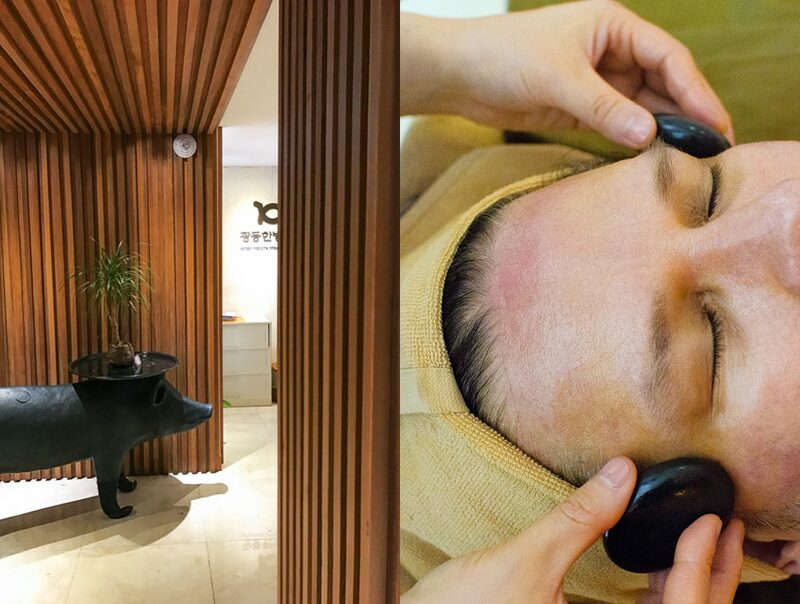 If you want to prep yourself for the long flight home or just want to relax and ease your jet lag before starting your adventure, this uniquely Korean wellness regime is the way to go. There are certain times when what we choose to eat gets strategic. 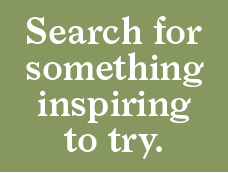 More than just seeking out our favorite foods, eating can have a higher purpose. Athletes know this. Runners carbo-load before a marathon to ensure they have ample energy stored for the long haul. And lately, the idea of food-as-medicine is on the rise with people making food choices based on a health benefit they would like to achieve. But the West is very late to this game. The Buddhist community has always practiced this idea, carefully choosing a diet in order to promote spiritual goals. 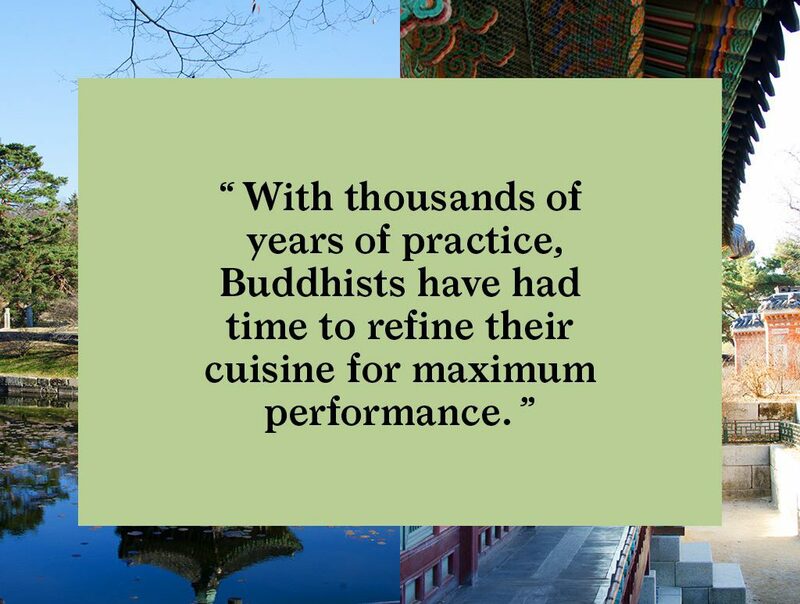 With thousands of years of practice, Buddhists have had time to refine their cuisine for maximum performance. 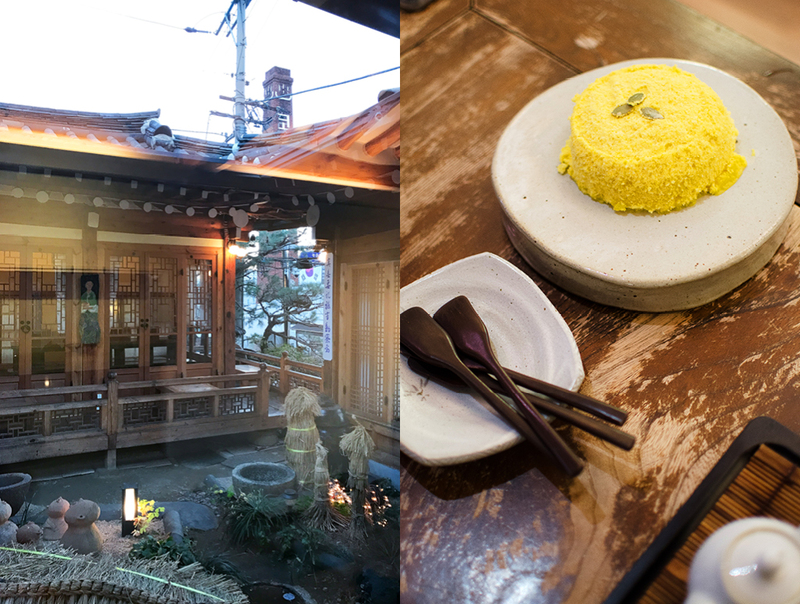 And since enjoying a meal is also a kind of spiritual nourishment, the Buddhist cuisine can be just as tasty as it is meditative. 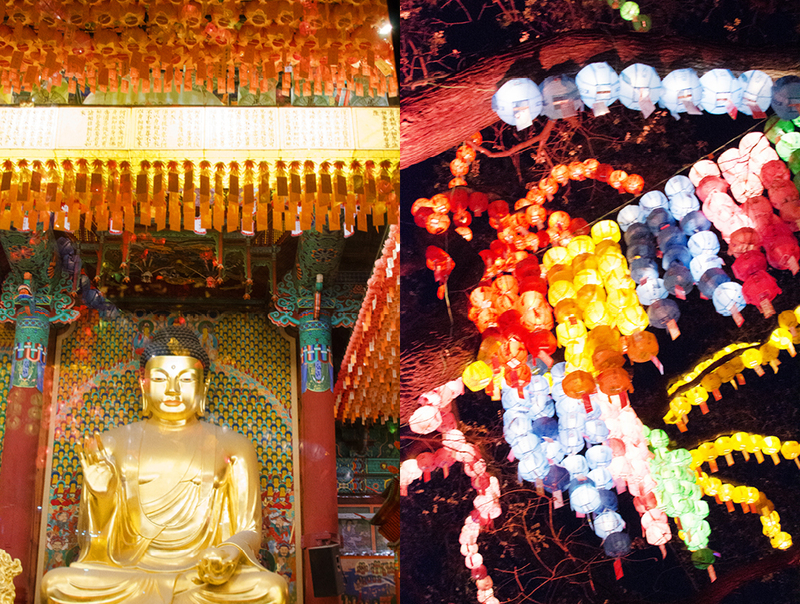 Korea is a great place to explore this special genre of cuisine, with the country’s strong Buddhist community paired with a unique national food culture. 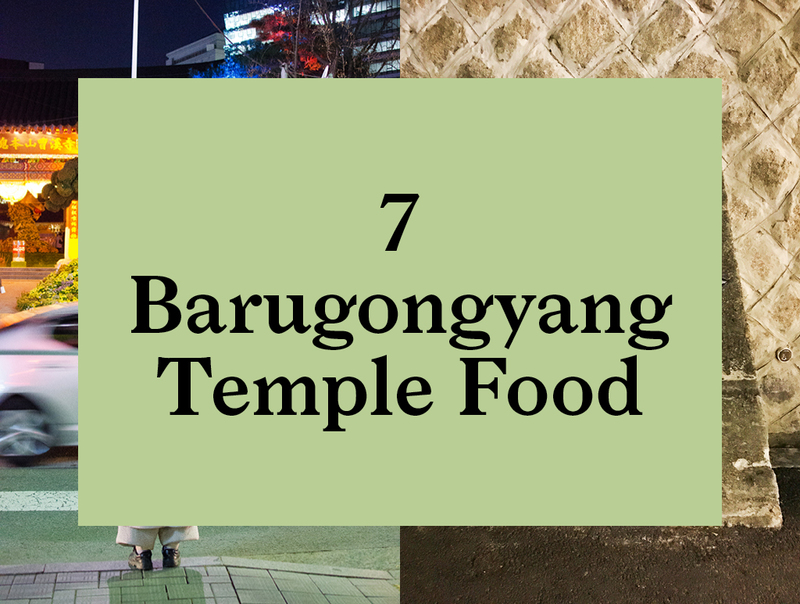 Just across the street from Seoul’s Jogyesa Temple, is restaurant Balwoo Gongyang on the second floor of the Temple’s cultural center. The tradition of temple food rests on the intimate connection between cook and ingredients, making the act of preparation a major distinguishing factor in the food presented. 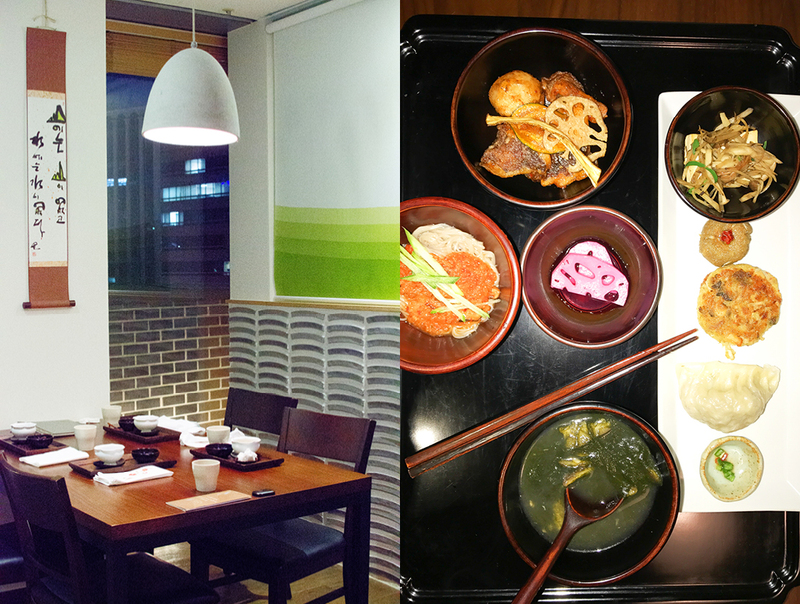 The menu is strictly vegetarian, and the ingredients are the other distinguishing characteristic of the cuisine. With a particular focus on promoting the practice of meditation, such common ingredients as garlic and onions are notable in their absence. The world over these ingredients form the base of many dishes but because of their strong flavor and effect on digestion, Buddhists consider them antithetical to their practice. But this absence is really an opportunity. In their place, other flavorful plants stand in and I can attest that their absence was not missed. 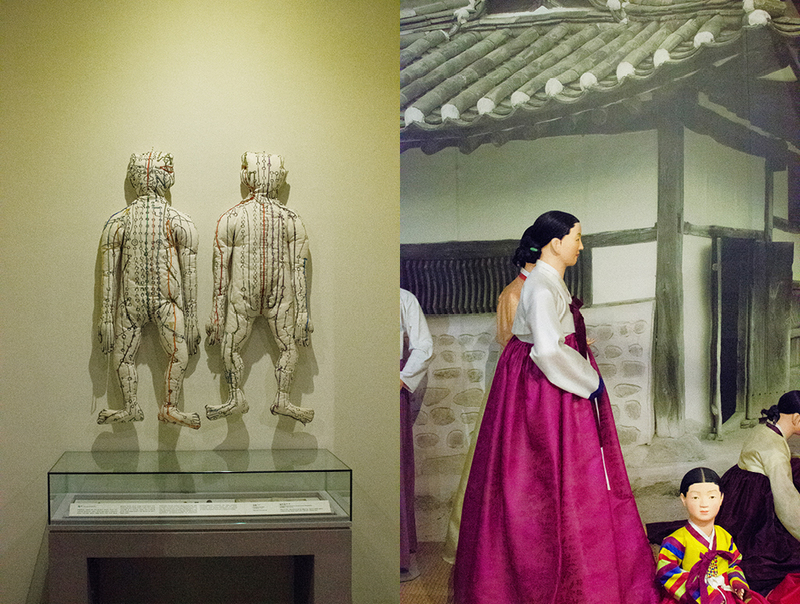 There is so much more to know about Korean history. 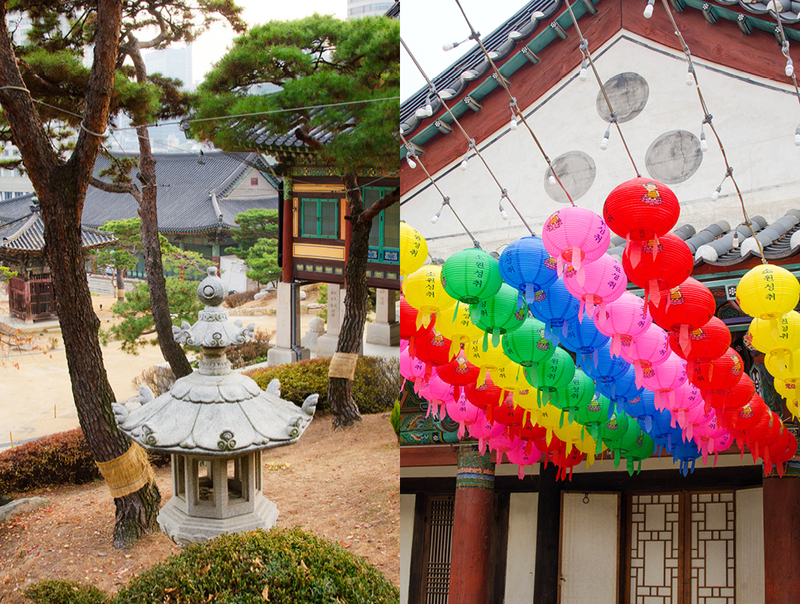 But with that short tour of seven Seoul destinations, you will have the beginnings of an understanding of this fascinating country and its thriving modern culture. 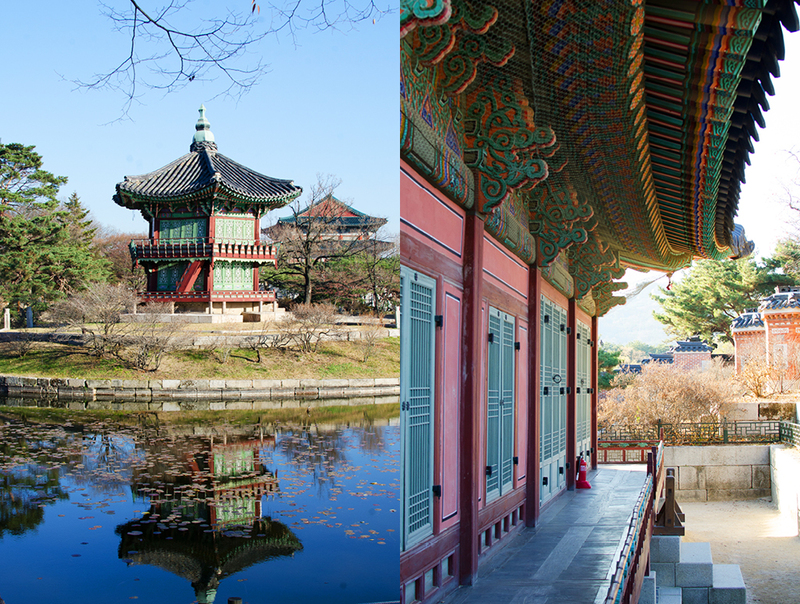 Planning a trip to Seoul to learn more about Korean history and culture? Here is the current weather and what to expect for the next few days.